ZipanguFlyer: Is AirAsia considering a Skymark takeover? Is AirAsia considering a Skymark takeover? On August 19th, the Nikkei Shimbun reported that the AirAsia Group has started considering an investment in ailing Skymark Airlines (BC/SKY), including a possible takeover. It said that the Malaysian LCC, a very important customer for Airbus, is also talking with the European manufacturer to reduce the penalties they are seeking with Skymark for the canceled Airbus A380 order (Skymark's Airbus A380 order in jeopardy. ), if AirAsia takes control of Japan's third largest carrier. Skymark holds 36 precious slot-pairs at preferred Tokyo/Haneda (HND/RJTT), something AirAsia is craving for. The report said that AirAsia has initiated discussions with several Japanese financial firms to make a bid for Skymark through AirAsia Japan (Mk II), which is expected to launch services from Nagoya/Chubu Centrair (NGO/RJGG) by July 2015 (AirAsia Japan selects Nagoya Chubu Centrair.). As far as voting-rights are concerned, foreign ownership of Japanese airlines is capped at 33%. Shares of Skymark rose almost 28% and closed at 230 JPY today. Major shareholders include Shinichi Nishikubo, its President and CEO, controlling 30.57%, travel agency H.I.S. with 7.72%, and Master Trust Bank of Japan owning 3.24%. However, both airlines denied the report. "There is nothing the company is aware of and we have not been approached by AirAsia regarding any financial support," said a press release from Skymark, while AirAsia Group CEO Tony Fernandes said "Never seen such rubbish. AirAsia has no interest in Skymark in Japan. There have been no discussions with Skymark. We (are) focused on new airline," through Twitter. But then again, almost always there's no smoke without fire, and Nikkei is usually a reliable source. AirAsia Japan CEO Yoshinori Odagiri hasn't denied as well, saying "Nothing has materialized, but we keep all doors open." It may well be that AirAsia is only dismissing the reports to help lower Skymark's shares as much as possible. The first child of Japan's deregulation, Skymark is the only start-up that has so far succeeded in cracking the ANA/JAL duopoly, under the leadership of hands-on and charismatic Mr. Nishikubo. It is also what forced All Nippon Airways (NH/ANA) and Japan Airlines (JL/JAL) to launch subsidiary LCCs Peach Aviation (MM/APJ) and Jetstar Japan (GK/JJP), respectively. However, increased competition with LCCs as well as the legacies lowering prices, coupled with a depreciated JPY, high fuel bills, and costs regarding the introduction of the A330 (Skymark Airlines inaugurates Airbus A330 service.) and A380, it tumbled to a full-year loss for the first time in five years for FY2013, announcing a 1.8 billion JPY loss. It was dealt a further blow when Airbus unilaterally terminated Skymark's A380 order, doubting the carrier's ability to pay. The European planemaker is said to be seeking 70 billion JPY in penalties, in addition to already-paid deposits amounting to 26.5 billion JPY, which is unlikely to be refunded. The figure is only expected to grow, as Rolls-Royce and interior makers also prepare to seek compensation from Skymark. As if that weren't enough, they posted a whopping 5.7 billion JPY loss only in the first quarter of FY2014 (Skymark posts 5.7 billion JPY loss for 1Q FY2014. ), prompting accountants to report "doubts about its ability to continue as a going concern." 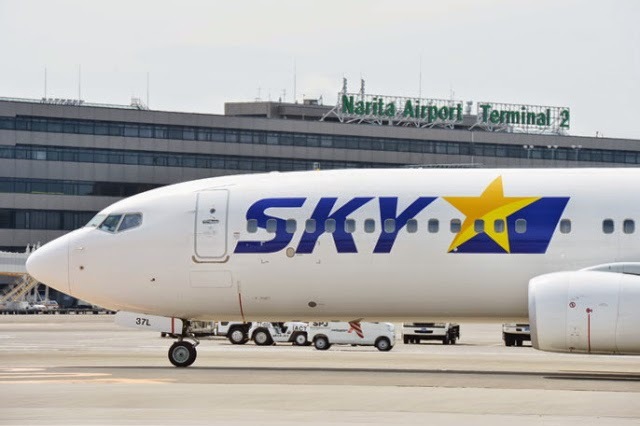 As of June, Skymark's cash and near-term assets stood at 7.2 billion JPY. Skymark is realigning their business by cutting unprofitable routes and concentrating on their core markets (Skymark announces Narita closure and Yonago cuts. ), while also raising fares and introducing a revamped fare system from October where the price will vary depending on availability. Financial support, something they have never asked for in their history, is desperately being sought for. However, with Mr. Nishikubo continuing to emphasize "We'll try to survive on our own," and ANA and JAL obviously not wanting an AirAsia brand in their by far most profitable (and protected) market, backroom political lobbying has probably already begun and it will not be easy for AirAsia. I certainly hope Skymark can make it on their own. It would be too bittersweet (and to Mr. Nishikubo the most) for an icon that virtually revolutionized Japan's air industry to be swallowed up, even if that is by another respected carrier that transformed the market in Southeast Asia. ANA to operate charter to Ulan Baatar. JAL to terminate Narita – Okinawa. Fuji Dream to go daily on Shizuoka – Kagoshima. ANA releases Winter 2014/2015 schedule. AirAsia Japan selects Nagoya Chubu Centrair. Skymark announces Narita closure and Yonago cuts. Skymark commences Sendai – Okinawa. ANA's Boeing 787-9 enters service. Vanilla Air announces Hong Kong and Kaohsiung. Skymark mulls pull-out from Narita and Yonago. JAL starts Summer 2014 seasonal routes. Spring Airlines Japan commences operations. ANA to fly Boeing 787-9 inaugural on August 7th.